This simple-to-prepare vegetarian dish takes only 15 minutes from start to finish. Place the chickpeas in a medium pan with the tomato sauce. Add 50ml cold water to each of the empty tubs, swirl it around, then pour it into the pan. Gently bring to the boil over a low heat. Turn off the heat and cover. Meanwhile, place a large pan of water over a high heat and bring to the boil. Then add the pasta and return to the boil for 5 minutes or until the pasta is just tender. Remove from the heat and drain thoroughly. Stir in the spinach and allow to wilt. Tip the pasta into a serving dish and pour the hot pasta sauce and chickpea mixture over the top, then toss together and season with black pepper. 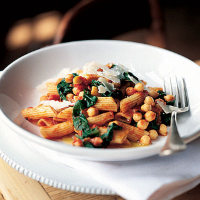 Top each serving with Castelli Vegetarian Cheese shavings and a drizzle of olive oil. For a hotter, spicier flavour, use 2 tubs of Waitrose Fresh Arrabiatta Sauce instead of the tomato and herb sauce.